Lady Flora Hastings unfairly suspected of illicit affair with nemesis of young Queen Victoria. Queen Victoria ascended the throne when she was barely 18 , in 1837. The young Princess’s public life changed immediately , but her private life stayed much the same. Victoria still lived with her mother, and her mother was still under the influence of Victoria’s childhood nemesis, Sir John Conroy. Victorie, Duchess of Kent was Victoria’s twice widowed mother. She had to raise Drina, Victoria’s childhood nickname by herself with little money. She also tried to shield her child from her dissolute uncle’s royal courts. She was German, not English, so she had few friends on court. The duchess was also very trusting and without her daughter’s strength of character. Sir John Conroy was a godsend to the Duchess of Kent. He managed what money she had and ran her household. The Duchess became very involved with Conroy’s family and it was rumored that she become Conroy’s lover. This is probably not true but Drina heard the rumors and was outraged, she also disliked Conroy for his treatment of her. Conroy wanted power and tried to raise the young princess to be dependent on her mother and him. Conroy convinced the Duchess that Drina’s life was in danger and that she also might be kidnapped at any time, by anti-royalists or by the king himself. The Duchess believed every rumor, she would not allow Victoria to sleep alone or even walk down the stairs by herself. Victoria had a nanny, Baroness Lehzen, who was also concerned about Victoria’s safety, but she was not a fan of Sir John. Victoria was kept away from court by Conroy and her mother. This was maybe not a bad thing, her 2 uncle’s had illegitimate children, drank do much and generally lead a dissolute life. The court was insulted by the actions of the Duchess and she became more isolated and more under the influence of Conroy. But he hadn’t accounted for Drina’s strength of character. She absolutely refused to appoint Sir John as her private secretary when she was 17. He tried to physically force her to sign a paper when she was bedridden recovering from typhoid. Her stubbornness and loyal Lehzen frustrated his aim to be the power behind the throne. But, once Victoria came to the throne, Sir John would not go quietly. Her mother remained completely loyal to Conroy and endorsed Sir John’s demands for his retirement: a large pension, a title and a permanent place as an advisor to the young queen. These demands were refused and Conroy remained part of the household. His continued presence distressed Victoria and influenced the young queen’s actions toward her woman of the household. 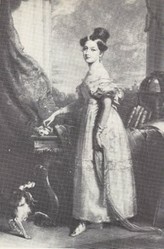 Lady Flora Hastings was an unmarried lady in waiting to the Duchess. She and Lehzen did not get along and Lady Flora was considered an ally of Conroy, so Victoria distrusted her. In 1830, Lady Flora visited her family in Scotland. On the way back, in January, she and Sir John shared a private carriage. Within a few weeks, Lady Flora was complaining of illness and her stomach started to look suspiciously large. Of course, even if the lady and Conroy had been intimate on the trip she wouldn’t have been showing in just a few weeks, but both women were probably pretty ignorant about the facts of pregnancy. We have no doubt that she is—to use plain words—with child!! (Dr.) Clark cannot deny the suspicion; the horrid cause of all this is the Monster and demon Incarnate, whose name (Conroy) I forbear to mention. Dr. Clark was Lady Flora’s doctor treated Lady Flora without actually examining her. This was pretty common, the patient just talked to the doctor and did not disrobe. So Clark thought she might be pregnant but had no proof. He did ask Lady Flora to let him physically examine her but she modestly refused. But he did ask Lady Flora is she was with child and this she denied. The swelling of her stomach changed with time, sometimes actually decreasing. This should have been a clue for Victoria, but she disliked Conroy so much she wasn’t very rational about him. Lady Flora was his ally, she was also probably his mistress and she was certainly unwed and pregnant. Victoria was outraged. Lady Flora agreed, in late February, to be physically examined by Sir Charles Clarke, a specialist in female disorders. He quickly determined that she was a virgin and therefore could not be pregnant. That settled the matter for a time and Victoria was contrite about her suspicions and the gossip, which Lehzen had helped spread. But Sir Charles had been uneasy about the diagnosis. He believed that Lady Flora was physically a virgin, but thought she might also be pregnant. He eventually told the Queen who was quite upset. She told the Duchess who stayed loyal to Lady Flora. The lady in waiting had sent a letter to her uncle, Hamilton Fitzgerald, which was published in the Examiner newspaper. So now the public knew of the court scandal. This now became a political matter. Lady Flora was from a Tory family and it was thought that Whig’s members of the household were trying to remove her from the court. By June Lady Flora was very ill and gossip started up again. The Queen was hissed at in public and was humiliated. She visited Lady Flora on her deathbed. After her death Lady Flora was examined and found to have an enlarged liver which led to pressure and swelling of her stomach. She had a large liver tumor, which killed her, but rumor at the time was that she died of a broken heart due to the Queen’s cruelty and gossip. Later in life, the Queen conceded that she had handled the entire situation poorly. But at the time her hatred for Conroy, her estrangement from her mother and the political ramifications had led her to treat an innocent, dying woman with cruelty. This lead to the first taste of unpopularity for the young queen. Too bad she was not married to Albert at the time. He undoubtedly would not have let the situation develop. Albert, once they were married, reunited Victoria with her mother and removed her from the influence of Lehzen. But it wasn’t until the death of Sir John that the Duchess found out that he had been robbing her blind for years. Albert probably would have been the first one to point an accusing finger-he was more of a prude than Victoria ever was, and thought very little of the English upper crust. I've never been a fan of this period of time, but this was seriously interesting. I had no idea. This is fascinating! I didn't know any of it. It was one of the darkest periods of the Victorian era. Even in the modern day, the population of Ireland has not yet recovered.